Experts from ATK and NASA are investigating the cause of voids in the aft segment of the next test motor for the Space Launch System (SLS). Known as Qualification Motor -1 (QM-1), the original aft segment was scrapped following the discovery of voids via examinations, only for its replacement to mirror the problem – possibly caused by processing and design changes in the motor’s insulation and liner material. NASA’s new Heavy Lift Launch Vehicle (HLV) will debut with two five-segment Solid Rocket Boosters (SRBs), providing the majority of the lift during first stage ascent. The ATK team has already enjoyed three static fire successes for the motor that was initially set to launch as the Ares I’s rocket’s first stage. 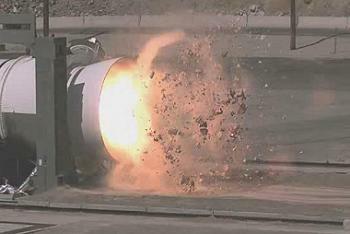 The three Demonstration Motor (DM) firings were successfully conducted at the company’s motor proving grounds near Promontory, Utah – with DM-3 the most heavily instrumented solid rocket motor in NASA history, sporting a total of 37 test objectives measured through more than 970 instruments. The results of the DM tests allowed ATK to complete the booster’s Preliminary Design Review (PDR) in conjunction with NASA, a milestone review that was conducted well within the planned schedule path for the opening SLS launch in 2017 on Exploration Mission -1 (EM-1). Following the DM test series, ATK moved into preparations for qualification testing of the new motor – opening with QM-1, which began with the first casting operation of the forward Segment in July 2012 at ATK’s Promontory facility. Casting operations continued without issue, with center segment casting operations beginning in August of 2012. However, QM-1’s original test target of mid-2013 slipped when an issue with the aft segment was found. Inspection of the segment showed it was contained an area where propellant had debonded from the inside of the segment wall. Following analysis, NASA decided to ask ATK to scrap the segment and cast a replacement. 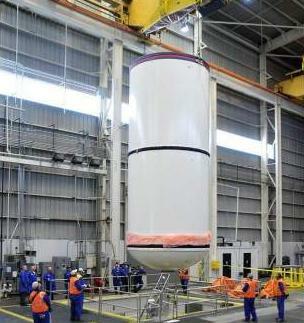 Preparations for QM-1 continued, with the shipping and integration of forward and center segments at the test site, while ATK went to work to replace the aft segment, following approval – post investigation – from NASA’s Marshall Space Flight Center (MSFC). 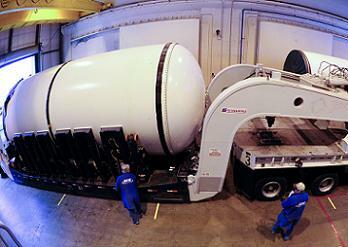 After ATK successfully cast the replacement segment in July, technicians carried out routine ultrasound and x-ray tests. Unfortunately, the tests showed this segment had also had similar voids (L2). Voids – though rare – are one of the items screened for in order to pass stringent operational requirements. Even for ground tests they could have significant impact to the time pressure traces that subsequently impact flight analysis models. Thankfully, ATK’s quality assurance processes – utilizing a standard operating practise – ensure no segment would ever fly with this condition, not least the five-segment motors. “These issues were identified through a modern, extensive inspection process that includes X-ray and ultrasonic techniques,” noted ATK’s Trina Helquist to NASASpaceFlight.com. “X-Ray and ultrasonic inspections are standard procedures and completed on all ATK solid rocket motor programs. However, due to the developmental status of the SLS booster, these inspections are even more rigorous than those on the Space Shuttle boosters. The likely cause of the voids points to a change in processing when using a relatively new material in the insulation lining for the segments, a material that has replaced the previous use of crysotile – the most common mineral form of asbestos. 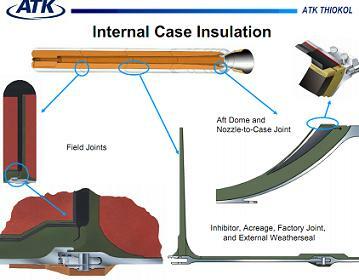 The replacement of asbestos in the insulation package has been noted as one of ATK’s long-term goals. Crysotile-free rubber insulation had already been qualified for Shuttle, but never used in flight. It was then baselined for Ares I and subsequently for the SLS boosters. 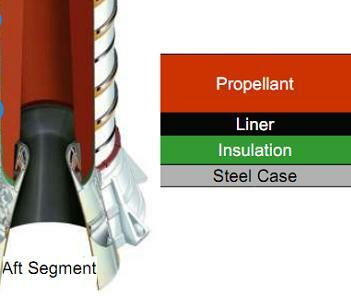 The previous insulation material used on the four segment shuttle boosters became obsolete as the shuttle fleet retired. As noted, the new material was used on all three of the DM test series motors, without issue – allowing for the investigation to focus on processing and design changes that may have contributed to the issue. “All three Development Motors used the upgraded insulation and liner material and this condition was not seen on the three previous successful ground tests of those motors,” Ms. Helquist continued. “However, we have made processing and design changes as we continue to mature the booster in preparation for design certification and eventual production. SLS Program notes also confirmed an investigation is under way at the NASA level, with discussions taking place on which of the two problematic aft segments will be dissected first to allow for a closer look at the issues. “Evaluation of all changes between the Development Motors (DMs) and the Qualification Motor (QM) continues at ATK. The actions taken during the (August) technical interchange are being assessed against the fault tree items,” the note (L2) added. “The tangent X-rays in the areas of the Ultrasonic Test (UT) indications are complete. X-ray has verified the only Propellant/Liner/Insulation unbonds and propellant voids are located in the areas of thick insulation near the factory joint ramps. Discussions concerning which aft segment (original QM-1 aft or QM-1R) will be dissected first are ongoing. The schedule for the dissection is still to be determined. 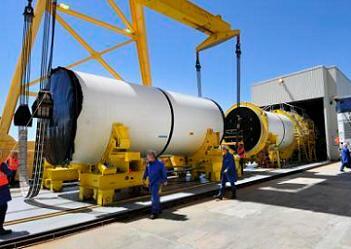 While confidence in finding the root cause is high, the static fire of QM-1 will now be delayed into 2014. However, with a large amount of margin in the test schedule, there is currently no impact on SLS’ debut launch date with EM-1. “A team of top experts from ATK and NASA who have years of experience with anomaly investigation has been assembled to work through the issue. We have confidence in this team and their ability to discover a root cause and recommend a corrective action,” added Ms. Helquist. “ATK’s rigorous inspection processes are part of the reason behind our 277 successful flights and tests of the four-segment and five-segment motors,” said Helquist. “Unlike other systems we are able to know intricate details of our motors before they even arrive to the launch site, which is why solid rockets are used when reliability and responsiveness are required.